Today’s bathroom design trends favor giving this once neglected space lots of TLC. If your home’s bathroom is small, you may wonder if it is still possible to make it a glamorous and relaxing retreat. 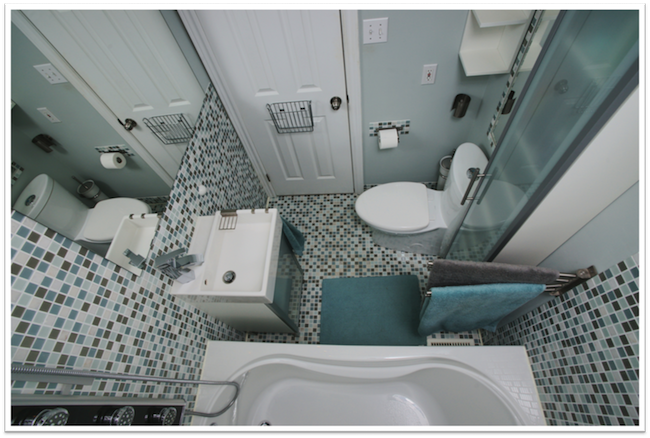 While you may not have the floor space to add a soaker tub or humongous shower enclosure, there are many ways to give a small bathroom a more spacious feel. 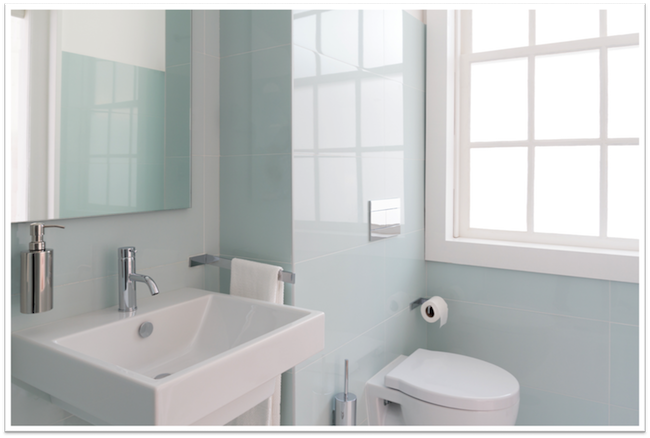 Wherever it’s practicable, use clear glass to visually open up a compact bathroom. When a bathroom is already little, the last thing you want to do is divide and partition it, as this will make it feel even more confining. For instance, if the shower’s current water containment system is an opaque shower curtain or a door made of privacy glass, consider the difference that would be made by having clear glass shower doors installed. With a transparent barrier in place, the bathroom seems to grow larger as the shower area appears to be part of the room as a whole, rather than a separate closed-off space. Even shelving can visually fill up space and leave a small bathroom feeling cluttered. However, you don’t’ want to get rid of much-needed storage space, just so the bathroom can feel roomier! The answer is clear glass shelves. These maintain the open look you’re trying to achieve while providing a handy storage surface. Finally, make the most of the clear glass on your bathroom window. Add just enough window treatment to give privacy, but try to allow plenty of natural light to stream into the space. You can even create the impression of a second window by installing a small wall mirror across from the window. In a small room, it’s important to keep the décor from becoming “busy” or looking cluttered. Put in place the necessary storage solutions so that items can be neatly stashed away, not left to clutter bathroom surfaces. It can also be helpful to veer toward décor elements that bring simple, clean lines to the space. Besides the glass shelving already discussed, this could be a modern corner cabinet with minimalistic design, or sleek towel bars and paper holder. Add the perfect décor elements and you won’t even stop to think about the bathroom being small. Be careful though, that any pieces you add are proportionate to the dimension of the space. For instance, hanging a huge chandelier over a standard-size tub in a small bathroom would look awkward. On the other hand, a small chandelier might be lovely above the sink. It’s also easy to add elegance without taking up space by simply replacing necessary items with more attractive alternatives. For instance, replace a prosaic bath mat with an extra-plush one in a rich jewel-tone. When it comes to towels, consider switching to linen to both contribute to the sense of space and add an upscale feel.